Shortly after launching their UP2 fitness tracker in the UK, JawBone has this week launched the UP3 which is now available to purchased priced at £130. The new JawBone UP3 features everything you would expect from a fitness tracker in the form of activity tracking, advanced sleep tracking, food logging, and heart monitor as well as offering a personal coach. Than ks to the inclusion of a Tri-axis accelerometer, and bio-impedance heart rate, respiration and Galvanic Skin Response (GSR) sensors. The UP3 features a rechargeable battery that is capable of providing up to 7 days worth of use on a single charge. Together with a medical-grade hypoallergenic TPU rubber strap bandage splash proof case that has been constructed from anodised aluminium. Using Bluetooth 4.0 BLE the JawBone UP3 fitness Tracker is also capable of connecting to its companion application loaded on to your iOS and Android smartphone. Everyone has had a life-changing experience sometime. This is one of those times. UP3 is simply the most advanced tracker you can buy. Its classic, durable design will stand the test of time. Multi-sensor technology adds breadth and accuracy to Smart Coach. Everything about UP3 says that the bar has been set higher. Wear one and go further. 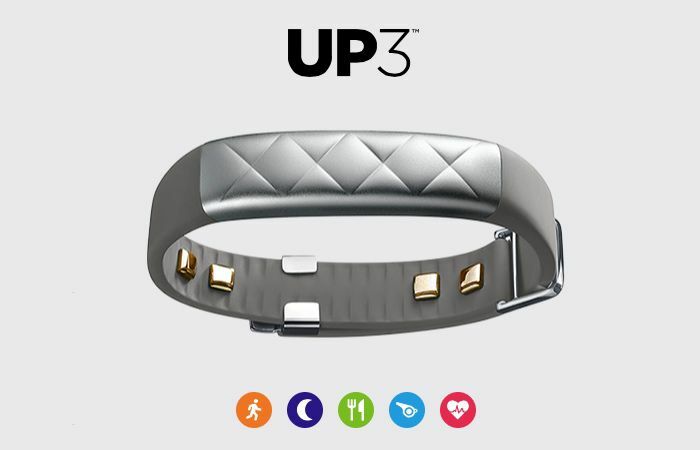 For more information on the new UP3 jump over to the JawBone website for details and to purchase for £130.